Studio Line: Touchstone Pictures - One Big Shot. One Big Mouth. The Switch Is On. Outrageously funny and charged with explosive action, hot young comedy stars Eddie Griffin (Deuce Bigalow: Male Gigolo) and Orlando Jones (The Replacements) team up for a fast-paced adventure in the tradition of Blue Streak and Rush Hour. Framed in a multimillion-dollar money-laundering scheme, upstanding investment banker Daryl Chase (Jones) suddenly finds himself running from the FBI -- and swapping identities with loudmouthed, low-life petty thief Freddy Tiffany (Griffin). Then, as he dashes for the Mexican border in search of the one man who can clear his name, Daryl discovers his new alias is even more wanted than he is. With hilarious performances and nonstop excitement at every turn, buckle up for a riotous road trip as this wildly mismatched pair deliver the laughs in double time! Box Office: Budget: $24 million. Opening Weekend: $11.736 million (1631 screens). Domestic Gross: $29.823 million. DVD: Widescreen 2.35:1/16x9; audio English Dolby Digital 5.1 & DTS 5.1; subtitles English, Spanish; closed-captioned; single sided - dual layered; 27 chapters; rated PG-13; 88 min. ; $29.99; street date 7/17/01. Supplements: Audio Commentary by Writer/Director George Gallo and Editor Malcolm Campbell; Extended Scenes with Optional Commentary from the Writer/Director and Editor; Deleted Scenes With Optional Commentary from the Writer/Director and the Editor; “Clues Companion” Featurette; Original Storyboards: The Emu Ranch; “Director’s Diary” Featurette; Storyboard to Final Scene Comparison; Trailer. At the risk of sounding too politically correct, I must admit that I hate to have to discuss race during movie reviews. It’d be nice for skin color to not play a factor in films, but unfortunately, it does, and when it comes to African-Americans, it usually works in a negative way. Black actors usually appear in supporting roles, and they rarely get to play in flicks that don’t operate off of general stereotypes. Although Double Take clearly ties in with many stereotypical notions, I thought it twisted them in an interesting and satisfying manner. The movie reminds us that things aren’t always what they seem, and it manages to relate the old “don’t judge a book by its cover” without seeming excessively pedantic. 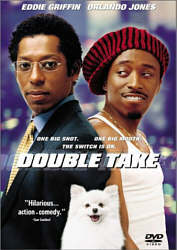 Double Take follows Daryl Chase (Orlando Jones), a very successful - and honest - investment banker who gets stuck in the middle of a money laundering scheme. Eventually, he encounters many parties who claim to represent various law enforcement agencies, and he takes his show on the road to sort out right from wrong. To his apparent misfortune, however, Daryl’s consistently saddled with a sidekick; earthy con man Freddy Tiffany (Eddie Griffin). After a few mis-starts, Freddy claims to be an FBI agent, but he changes some stories so much that Daryl doesn’t know what to believe. Most of the movie functions as a pursuit; many different factions chase Daryl, and the matters complicate when Freddy and Daryl switch identities to throw them off their trail. It’s a convoluted plot, but not exactly something that invents the wheel. At its heart, Double Take is a wacky buddy flick that tosses in a fair number of action scenes. Its main difference stems from the fact that our protagonists are black, and I must say that I liked the movie’s ultimate message. Too many films put the “street” guy against the race-denying yuppie. Very rarely do we find wealthy, sophisticated black characters who are presented as anything other than sellouts; take Pierre from Bamboozled, for example. I won’t slam Spike Lee’s decision to make Pierre such a white wannabe because it fit the film’s overall message, but too often movies simply mock and deride any black characters who don’t live to “keep it real”. In both Daryl and Freddy, we see something different. Daryl easily could have become a cheap gag as a still, uptight buppie, but he never does so. Instead, he comes across mainly as a fairly rich, full leading man sort, and Jones does a very nice turn in the part. He treats the role in a realistic manner, which means that while Daryl’s fabulously wealthy, he really doesn’t seem like any sort of sellout. To too many people, being black is a truly monochromatic experience; if you don’t listen to rap and dress like a thug, then you’ve betrayed your race. Jones’ performance as Daryl shows that there’s a middle ground for a stylish, smart and believable black man in the movies. Griffin is less successful, but admittedly, he may have had the tougher road. Initially we’re supposed to see Freddy as nothing more than a loud, obnoxious street dude, but as the film progresses, we discover additional nuances to the character and learn that the grating persona seem at the start is mainly an act. However, Griffin lacks the ability to turn off the boisterous side of Freddy. We’re supposed to take him seriously as a law enforcement agent, but he still seems the same. This worked when he was putting on Daryl, but the act continued even when no one was around; for example, Griffin still provided shtick even when he was alone in the middle of the desert. Griffin couldn’t pull off the quieter, more authoritative side of the role, which hurt the film’s later scenes. Still, I liked the fact that Freddy wasn’t just another petty crook with a loud mouth. More so than most films, Double Take pokes fun at the conventions associated with “keeping it real” and shows how stupid they are. I don’t know exactly who decided that all blacks should behave in a certain way, but it’s good to see a work that points out these absurdities. Beyond any form of social message, much of Double Take simply provided fun. It wasn’t a terrific comedy, but I must admit that I got a fair number of laughs out of it, mostly through the fine performance of Jones. He has a very inconsistent track record. He didn’t add much to The Replacements, and he came across extremely poorly in Evolution. In that flick, he was saddled with the sort of role I dislike; he played an apparently-educated guy who acted like a buffoon. Happily, that wasn’t the case during Double Take, and Jones’ frisky and light performance helped make the movie a success in the long run. Although the film had plot holes the size of Winnebagos and lacked anything terribly new or fresh, it still offered a fairly fun and entertaining action comedy experience. Double Take appears in an aspect ratio of approximately 2.35:1 on this single-sided, dual-layered DVD; the image has been enhanced for 16X9 televisions. The disc offered a consistently fine visual experience with few concerns to note. Sharpness looked crisp and well-defined throughout the movie. At no point did I see any signs of softness or fuzziness, as the film always appeared clear and distinct. I saw some examples of moiré effects at times, but I didn’t witness any jagged edges or edge enhancement. Print flaws remained very minor. I saw a few examples of specks and grit, but these were always slight. As a whole, the movie seemed to be nicely clean and fresh. Double Take featured a naturalistic palette for the most part, and the colors appeared to be vibrant and rich. The movie made positive use of these tones, and they always stayed clear and accurate, with no problems related to bleeding, noise or other concerns. Black levels seemed to be deep and dense, and shadow detailed looked appropriately heavy but not excessively thick. In many films that feature dark-skinned actors, the lighting fails to account for their coloring, and they occasionally become hard to see in low-light situations. That wasn’t a problem during DT, as all of the performers remained easy to discern. Ultimately, Double Take offered a very solid picture that consistently looked terrific. Also quite pleasing were the soundtracks of Double Take. Buena Vista DVDs often include both DTS 5.1 and Dolby Digital 5.1 mixes, and DT falls into that category. As is also often the case, I discerned very little difference between the two tracks. The DTS mix appeared to be marginally more robust, and it also seemed to integrate the various elements a little more cleanly, but as a whole, I think the two stayed very similar. That was fine with me since the audio seemed to be so good. Double Take offered a soundfield that nicely used all five channels, though it did display a moderate emphasis toward the front speakers. From that spectrum, I heard solid stereo separation for the film’s music, and a lot of effects usage appeared from that area as well. Sounds seemed to be cleanly and appropriately localized, and they blended together neatly. Whether a scene stuck with gentle ambience or it portrayed a loud action piece, the soundtrack created a clear and accurate atmosphere. Although the forward speakers did dominate the proceedings, the surrounds contributed quite a lot of audio as well. During quieter scenes, the rears usually offered soft but effective environmental sounds and reinforcement of the music. However, they really came to life during the movie’s action bits, as the surrounds added a positive layer of involvement to the affair. These elements helped make the movie more exciting and engulfing, and they did so in a natural and believable manner. Audio quality also appeared to be solid. Dialogue sounded distinct and crisp, and speech lacked any signs of edginess or problems related to intelligibility. Effects were nicely vigorous and dynamic, and they packed a strong punch when necessary. Those elements showed no distortion and they seemed to be clear and bold throughout the film. Music also came across as rich and lively, as the score and the many songs heard provided clean sound with fine fidelity. Ultimately, Double Take provided a very positive auditory track that worked well for the material. Double Take includes a nice package of extras. We start with a running audio commentary from writer/director George Gallo and editor Malcolm Campbell. Both men were recorded together for this running, screen-specific affair. Overall, it was a chatty little piece, but the information provided lacks a great deal of depth. As often occurs during audio commentaries, this one features a great deal of happy talk and praise. We learn how great everyone was and get the impression that Double Take was a truly great film. In addition, the pair - though especially Gallo - often tell us of the little twists found in the movie. This could be useful, but it seems a little pointless; these turns aren’t evidence when you first watch the flick, but if you take it in a second time, they should be much more evident. Since you’ll undoubtedly check out the commentary during a rescreening of the movie, I don’t think that the insight heard here was required; you’d likely see these elements for yourself. Gallo and Campbell add some decent details about the production, and they also relate many of the challenges encountered along the way. Still, the praise and analysis dominated the track, which ultimately meant it was less than terrific. It also got confusing since Gallo and Campbell had trouble distinguishing between the actors and the characters; they often referred to the performers by their roles’ names, and vice versa. It could be disconcerting, and it extended to other areas as well; Gallo stated that he wanted one character to resemble TV actor “Andy Griffin”. Some material that was cut from the film appears in two different sections. We find three Extended Scenes and four Deleted Scenes. The former all run between two minutes, 45 seconds and two minutes, 55 seconds, for a total of eight and a half minutes of footage. The “Deleted Scenes” go between 48 seconds and four minutes, three seconds for seven minutes and 26 seconds of shots. The “Deleted Scenes” weren’t worth a whole lot. As one can see from their brevity, there wasn’t time to do much, and I thought they lacked much of substance. One nice touch: the DVD’s producers stuck a few seconds of footage from the finished film prior to each clip so that we would be able to place it in its correct context. As for the “Extended Scenes”, these were a little more compelling - at least some of them were. One just gives us more dancing at the gas station, but some others added substantial material. This was especially true for the longer version of the ending. All of the “Deleted Scenes” and the “Extended Scenes” can be viewed with or without commentary from writer/director Gallo and editor Campbell. Their statements were a little sparse, but they provided the basic necessary information that told us why the clips were removed from the film. Otherwise, the men added little to the table. Next we discover the Director’s Diary, a 27-minute and 50-second video program that offers an overview of the film’s production. The show combines comments from a variety of participants - though it usually spotlights Gallo - with a load of excellent footage from the set. The latter elements make up the lion’s share of the piece. We see a few interview clips, but even those are conducted on the set itself. In addition, when we see shots from the film, they’re never gratuitous; they always appear to illustrate points made in the documentary, and they usually add a lot to the experience. For example, we view multiple angles of some effects shots. Gallo’s remarks don’t expand much on what he says during the commentary, but they add a little perspective to the piece. Frankly, I would have been just as happy if they’d showed the footage without any dubbed audio. The material from the set is so cool that it’d be equally enjoyable - if not more so - had we just heard the natural sound. In any case, I really enjoyed the “Director’s Diary”, as it offered a nice look at the filmmaking process. I found the Clues Companion to be somewhat redundant. Essentially, this three-minute piece combines Gallo’s comments about the movie’s subplot hints with the corresponding shots from the film. I guess it’s a nice recap of these points, but if I really wanted to see them laid out for me, I’d prefer to check them out along with the movie proper. Anyway, I won’t complain about it, since some folks might like this short synopsis. Two storyboard features also appear in the Storyboard to Film department. There you can watch the original boards for the “Emu Sequence” and also view the finished product. The latter goes for seven minutes, 50 seconds, while the latter runs three minutes, 10 seconds. The boards are accompanied by comments from director Gallo, who tells us the differences between the scene’s conception and its final realization, and he also provides some factoids about the segment. It’s a nice little presentation that made this sequence more interesting to me. You can utilize your lonely little “angle” button during the “Opening Title” segment. There you can choose to view that sequence’s storyboards, its final film result, or a split screen combination of the two. No comments from Gallo appear during this 105-second piece. I’m not a huge fan of storyboards, but this was a pretty solid effort. In addition to the original theatrical trailer for Double Take, we also find Sneak Peeks for three other Buena Vista releases: Unbreakable, O Brother Where Art Thou, and Bounce. To the likely chagrin of some, these ads also appear automatically at the start of the DVD; however, since they can be easily avoided through a press of the “menu” button on your remote, I hope they won’t cause too much angst. Lastly, Double Take includes some Easter Eggs, both of which pop up in the “Bonus Materials” area. For the first one, go to the initial screen in this department and highlight “More”. Then go “right” on your remote and it’ll light up the words “Double Take” on Eddie Griffin’s arm. Click that and you can watch a fairly inane 135-second “Gag Reel”. As for the other egg, head to the second screen in the “Bonus Materials” section. From there, highlight “Theatrical Trailer” and click to the left. Once again “Double Take” appears on Griffin’s arm, so click on this. From there you’ll see two minutes and 45 seconds of stills. Some show publicity shots, but most are production images that feature the crew. Although I expected little from Double Take, I must admit that I found it to offer a fairly enjoyable and engaging buddy flick. The story had flaws, and a few additional concerns popped up along the way, but the actors made it pretty engaging, especially due to a terrific turn from Orlando Jones. The DVD offered excellent picture and sound plus a very good roster of supplements. If this kind of action-comedy is your bag, you may want to give Double Take a spin.